DogLCD lets you use the DOG-M LCDs from Electronic Assembly. Only 4 pins are used. LiquidCrystal works perfectly with Teensy 2.0 and Teensy++ 2.0 and Teensy 3.0. The EADOGM081, EADOGM162, and EADOGM163 are supported. This photo shows a EADOGM162S-A with EALED55x31-A backlight. DogLcd works on Teensy 2.0 and Teensy++ 2.0 and Teensy 3.0. The DogM displays are able to receive 3.3 volt signals, even when running at 5 volts. Create the DogLcd object and specify the 4 pins where the LCD is connected. You can connect more than one LCD and create separate DogLcd objects for each. Initialize the display. Type should be DOG_LCD_M081, DOG_LCD_M162, or DOG_LCD_M163. Print a number or text. This works the same as Serial.print(), but prints to the LCD. Move the cursor to position (x, y). These are zero-based coordinates. Many other functions are available. See below for links to more details. This example can be loaded with File > Examples > DogLcd > HelloWorld. 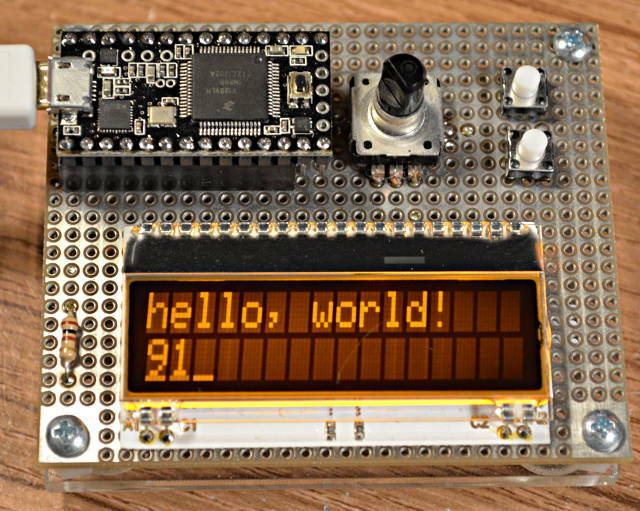 Demonstrates the basic use of a DOGM text LCD display. For use with Teensy 3.0, the DogM LCD can be run at 5 volts. It is able to accept the 3.3 volt signals from Teensy 3.0. Because all 4 signals are unidirectional from Teensy 3.0 to the LCD, there is no issue with 5 volt signals driving 3.3 volt only inputs. For more details, please refer to the official DogLcd library page and the DOG-M LCD page. 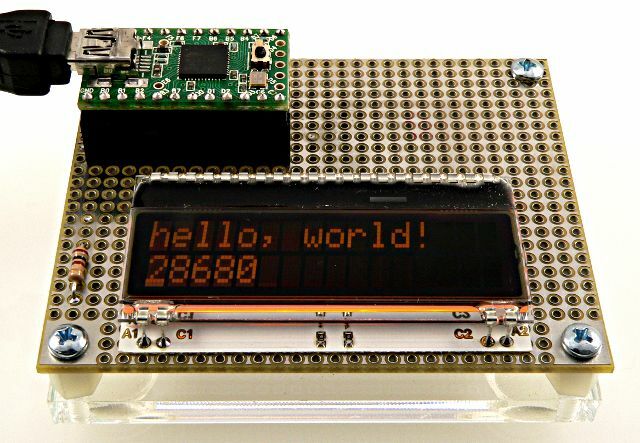 The display and backlight shown in the photo were purchased from Mouser Electronics.